Said engine is a 4.0 litre V8 unit with direct injection and twin turbochargers that offers two outputs, depending on the GLC 63 4Matic+ variant chosen. On models bearing the ‘S’ in its name (i.e. GLC 63 S 4Matic+ or GLC 63 S 4Matic+ Coupe), the mill churns out 510 hp at 5,500-6,250 rpm and 700 Nm at 1,750-4,500 rpm. On the other hand, those who opt for non-S models will have to make do with “just” 476 hp and 650 Nm. Regardless of which you prefer, the V8 is paired with an AMG Speedshift MCT nine-speed sports transmission and AMG Performance 4Matic+ permanent all-wheel drive with variable torque distribution. Additionally, to make sure the V8 is heard clearly, the exhaust system features flap technology but an optional Performance exhaust system is available if that isn’t enough. In terms of the all-important zero to 100 km/h sprint time, non-S versions will accomplish the feat in just four seconds, while the more powerful option does the same feat a little quicker at 3.8 seconds (C 63 Sedan takes 4.0 seconds). This applicable to both the standard and coupe body styles, including the electronically limited top speed of 250 km/h. To make sure there’s some agility to go along with the muscle, all GLC 63 models are equipped with the company’s three-chamber air suspension system and adaptive dampers. The former is adjustable (three stages available) by activating or deactivating individual air chambers to suit the required need at the time (comfort or handling). Meanwhile, the adaptive dampers can also be set to one of three stages – Comfort, Sport and Sport Plus – whereby the rebound and compression levels are adjusted independently of each other, and the freely programmable maps allows for a wide spread between minimum and maximum damper force. That’s not all, as the GLC 63 4Matic+ comes with a mechanical rear-axle limited-slip differential (LSD), while the GLC 63 S 4Matic+ is fitted with an electronic rear-axle LSD instead. These work together with the car’s three-stage Electronic Stability Programme (ESP On, ESP Sport Handling Mode and ESP Off) to deliver the best dynamics, according to Mercedes. As mentioned earlier, the really hot SUV comes with the AMG Performance 4Matic+ all-wheel drive, which can also be found on the new E 63. The system is primarily rear biased but if necessary, will direct power to the front axle via an electromechanically controlled clutch. 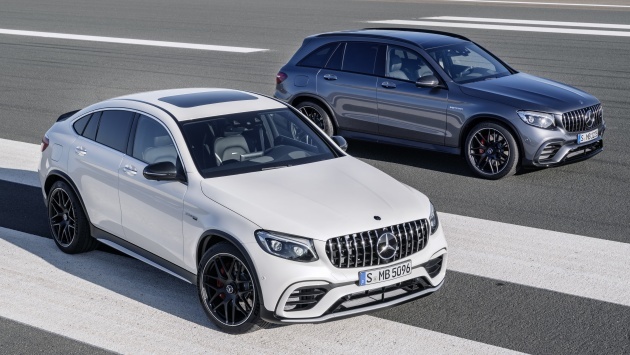 These systems (engine, transmission, suspension, ESP and all-wheel drive), including the car’s speed-sensitive sports steering, can be adjusted via the GLC 63’s AMG Dynamic Select system. Four modes are offered here – Comfort, Sport, Sport Plus and Individual – the latter of which allows a personalised setup. On S models, an additional mode – Race – is added to deliver maximum performance. As you’d expect, there’s plenty of visual drama to match the ludicrous performance, with the highlight being the Panamericana grille as seen on the GT R and GT C. The GLC 63 also gets sportier bumpers similar to those on the E 63, with details such as front and rear diffusers and chrome-plated twin tailpipes. Other additions include a spoiler lip on the roof for both body styles. Standard 19-inch ten-spoke light-alloy wheels painted in titanium grey with a high-sheen finish are fitted to the GLC 63 (with 235/55 front and 255/50 rear tyres), while the GLC 63 S gets larger 20-inch five-twin-spoke light-alloy wheels (same finish) instead, shod with 265/45 (front) and 295/40 (rear) tyres. These can be substituted with other optional wheel/tyre combos, including forged wheels. Inside, Artico man-made leather can be found nearly everywhere, including the instrument panel (with contrast stitching). The material can also be found on the standard sport seats, paired with areas of Dinamica microfibre. On S models, the interior kit list includes a Performance steering wheel in black Nappa leather/ Dinamica microfibre, AMG badges in the front head restraints and AMG instrument cluster with red highlights. Mercedes also offers a variety of optional extras for those who want to spruce their purchase further, including the Night package, Exterior Carbon Fibre package and Performance Studio interior. Some of these are standard on the special “Edition 1” model of the GLC 63, namely the Night package and Aerodynamics package. The GLC 63 Edition 1 also comes with sports stripes on the sides of the vehicle in yellow or matte graphite grey, depending on the paint colour and model variant. Matte black 21-inch cross-spoke forged with highlights in the form of yellow or high-sheen rim flanges are also standard here. The cabin of the special model feature sport seats upholstered in black Nappa leather with yellow contrast stitching in a specific diamond pattern. This can also be found on the door panels, armrests and centre console. Further yellow highlights are also applied on the instrument cluster, floor mats and Performance steering wheel. Wah! Macan have to stand aside! Yes, especially when the V-8 ROARS. Who Buy a Premium SUV ?? Most importantly, Who buy a ‘Performance’ SUV when U can get performance from sport coupe & sports car ?! Mercedes/BMW/Audi made loads of $$$ by selling it to the Rich Americans who like everything Big that comes with Performance. This design is a failure, only gen2 wannabe. Wah, I din know Gen2 so POWERFUL & BIG one ah. Are U still sleeping ?? Wake up please. This is 2017, Not 2004 the yr Gen2 made its maiden debut. So pity, designer has no idea so copied Gen2 design. Pipu who can afford it dun spend their time come here bash left right center. I kinda prefer the exterior design of the lower range GLC 43 AMG. Better looking than Macan. Not that Macan is ugly, just that this GLC AMG stands out more. Seriously how did this idea comes up?